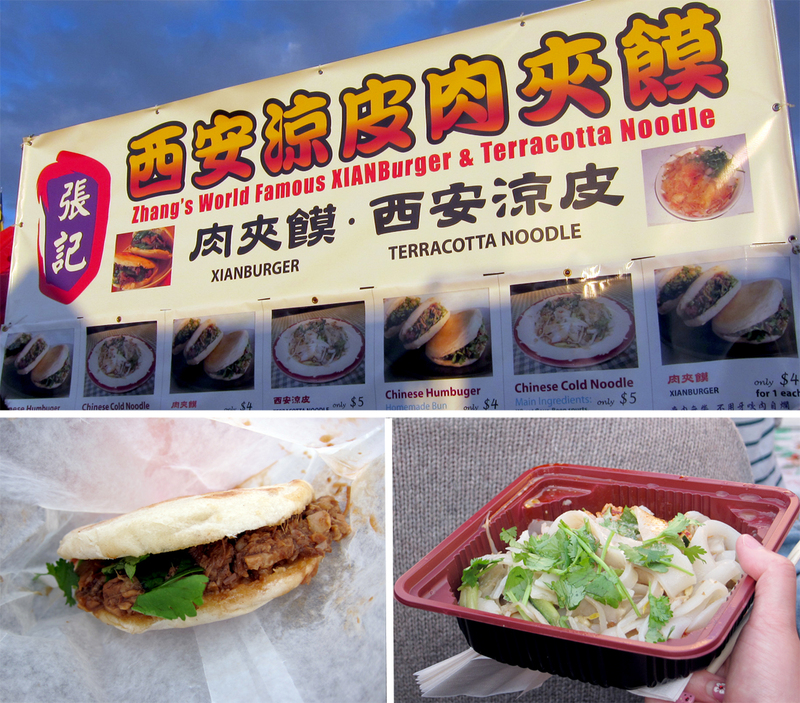 I love night markets, so naturally I couldn't wait to check out the new one that just popped up next to Brighouse skytrain station. I think they made a very smart choice in terms of convenience, because despite the free parking, it was horrendous trying to get into the parking area with major traffic jam. We actually arrived early only to be told to park underneath the skytrain station, at the moment I was not happy due to the distance. It was not until we were about to leave, when I realized it was really a blessing in disguise, because we were not stuck in traffic just for trying to get out of there. 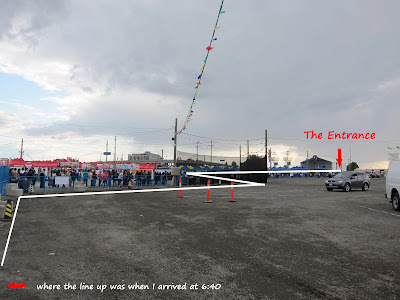 After a short walk from our parking lot, this was what I saw: a seriously long line up. If the weather was nice, I wouldn't have minded so much, but it was really cold to stand there for more than half an hour just to get in. 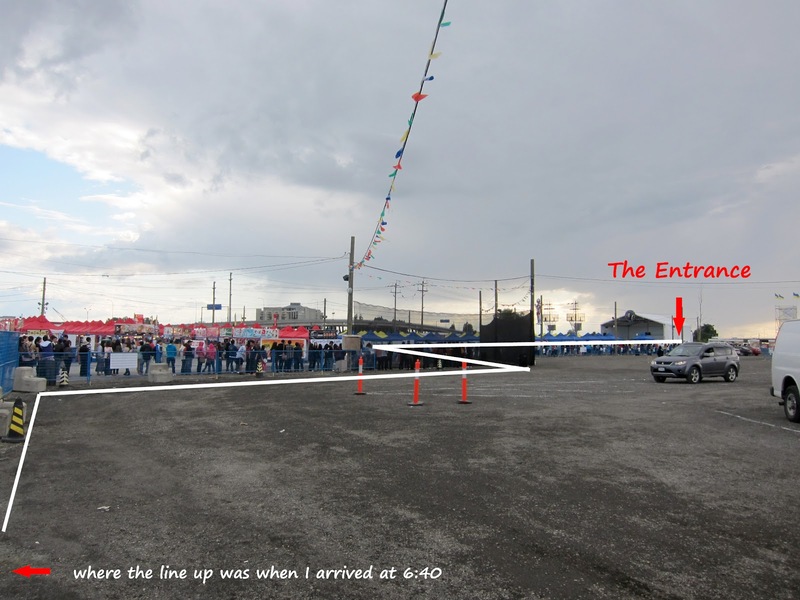 Now it makes me wonder, just how early do you have to come to be the first person in line. The minute I got through those long awaited gates, I rushed to the TW stand for some oyster omelet. After all this is what I came for. At $7 a piece, it's actually quite pricey. Usually you can get them at BBT restaurant for about $6. The oyster omelet (left) we got was kinda disappointing, the sauce was watery, there wasn't enough egg to gel the whole thing together, but there were quite a few pieces of oyster. For the price, I would have preferred the ones at either Pearl House or Corner 23. The 2nd oyster omelet was from our friend who joined us about an hour later. Theirs looked much better, and the sauce was tastier as well. So, I guess they have inconsistency issues. 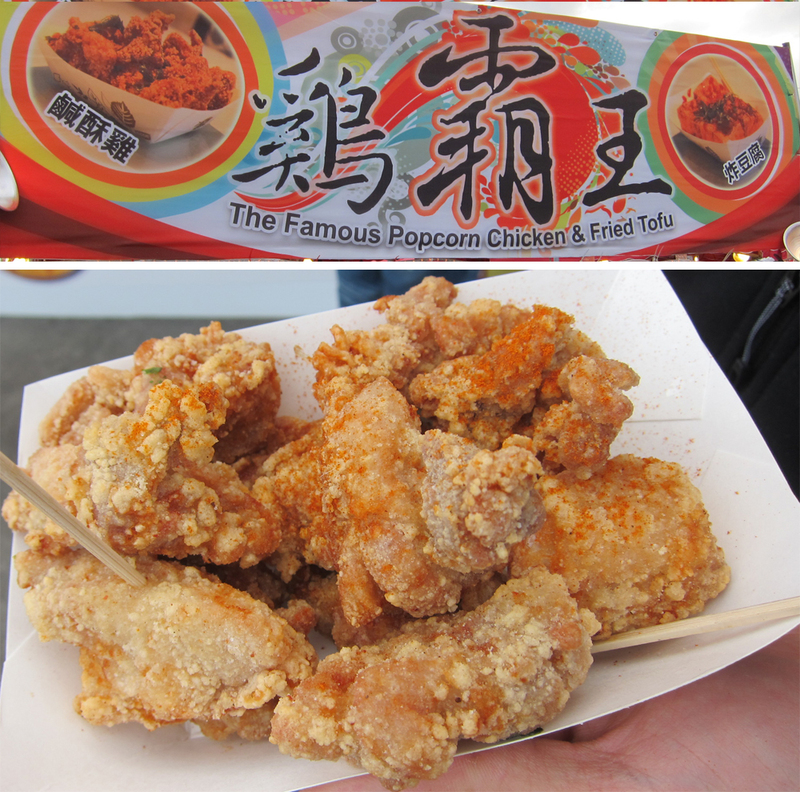 The popcorn chicken ($5) wins for best dish of the night. They fried real basil leaf along with the chicken just like the authentic ones. The chicken was crispy on the outside and really juicy on the inside. On top of that the each piece was huge with barely any skin on them. 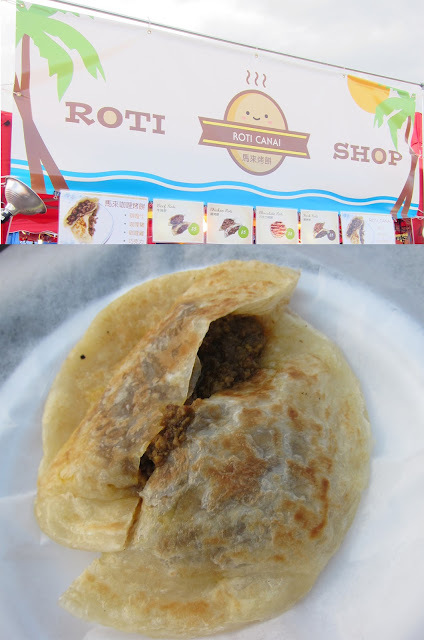 Next thing we tried was the pork roti from Roti Shop ($5). The roti was fluffy and buttery. The pork stuffing was packed with curry flavor, in fact a little too much, as I found it to be slightly salty. Although this was pretty good, the downfall was it's packaging. There were no wrapping around it, so the curry sauce was free to drip everywhere, and it was all over my hand by the end of it. At this point, both R and I were pretty full. So we decided to get one last thing (at the time, I really thought it was going to be the last), the XIAN Burger. This was another one of those messy food like the roti, but the fortunate thing was it comes in a bag, so it didn't drip everywhere. The toasted Chinese steam bun was perfect for the saucy and tender braised pork. They were also serving these terracotta noodles which I really wanted to try, but was simply too full, so here is a picture of it from someone standing next to me. I know I am not suppose to eat any more, at least that was what my stomach was telling me, but I just couldn't resist that cute looking egg pudding in a egg shell. Plus you can actually get something for under $5 is consider a good deal, but it was pretty small. 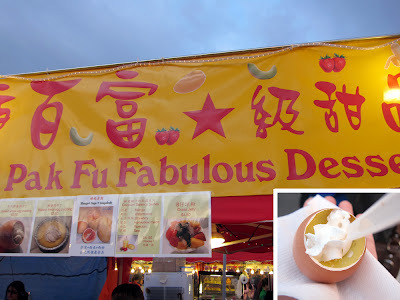 The egg pudding was really good, creamy and sweet and just the perfect size to end the night of feasting. I really wanted to try the roasted German pork hock, because it looked so delicious roasting on these racks, but it was simply too big of a portion for 2 people. If you go with a bunch of people, this would definitely be worth the $12 price tag. 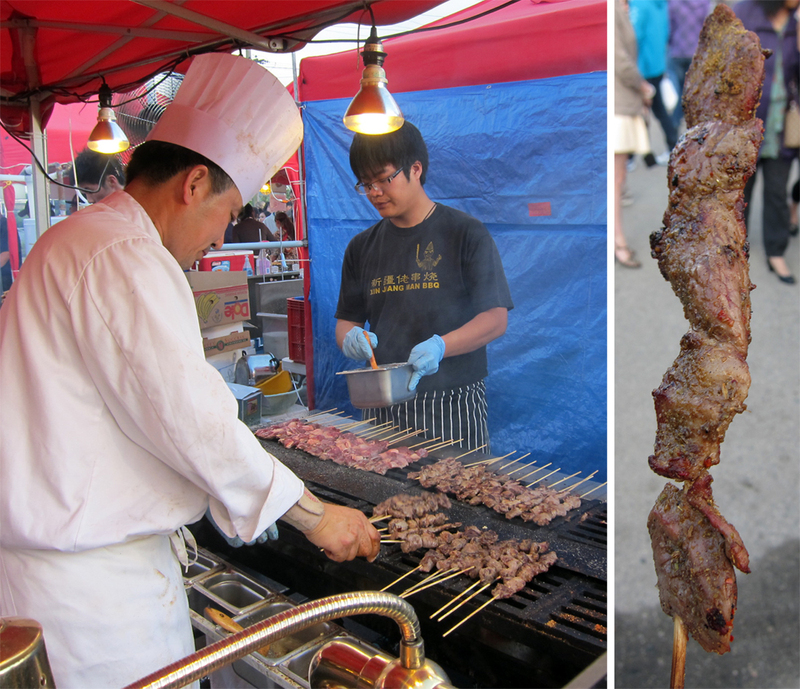 Overall, night markets are a good place if you want to try a variety of different food. Although they appear to be street food, it doesn't necessarily come with a street price. 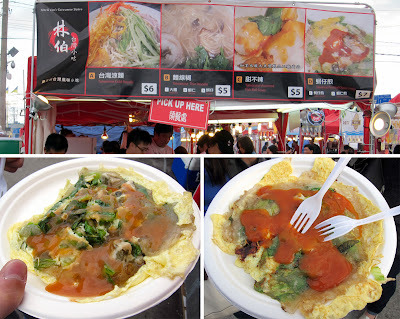 Most food item are $5 and up, as a prime example the osyter omelet is actually $7, but restaurants only charge about $6. Therefore, if you don't mind the price, and like varieties, the night market is definitely the way to go. You forgot to mention a RNM staple, Takoyaki! It's like the night market's version of the donut machine at the PNE!